Roofing is not easy work to do only experts can do better and safe. The roof is what protects your home from the elements and ensures that your family is safe and comfortable. Poor roof construction or design and leaks can result in collateral damage, including water runoff that’s channeled incorrectly, which erodes your home’s foundation, water ponding on the roof that causes leaks and sagging or even paint damage to the exterior walls of your property. Roof maintenance and periodic replacement are critical to maintaining the structural integrity of your property. If your roof is close to the end of its lifespan, you should start thinking about the roof replacement options. The ideal time of the year to have a replacement roof installed might not be necessarily what you think. Winter might not be the ideal time for roof replacement installation for obvious reasons. Besides the ice and snow, the extreme cold tends to make roofing materials brittle and hardened. Shingles may even crack if installed during winter. 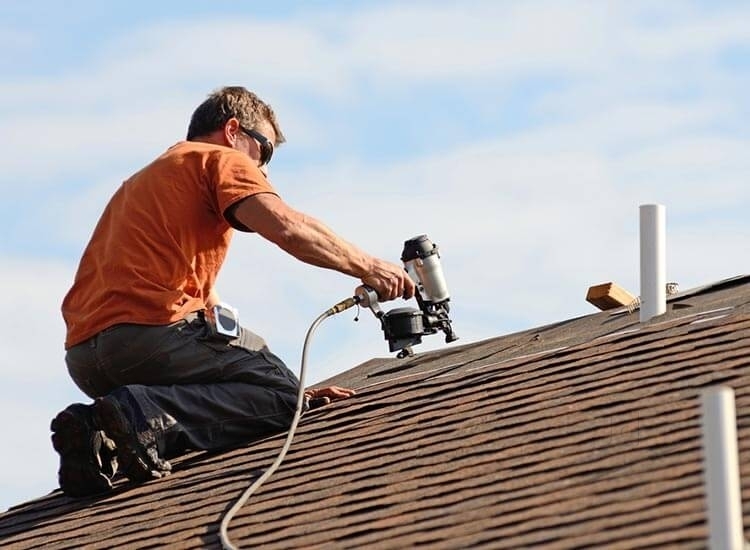 The tools used by roofers don’t work as well in extreme temperatures while the sealants cannot be applied as effectively, and shingles will take longer to adhere to each other than they would if the temperatures were higher. Winter can be the ideal time for roof replacement installation if your geographic location or Roofing material allows for the installation. During the winter, roofing contractors are looking for work and often lower their prices. Winter is the perfect time to get a quality metal roof with the least amount of stress and the best price. So, make the most of this. If you plan to get your roof replaced in the spring, you might as well consider getting it done in the fall, whenever possible. If the situation with your roof is worsening or there are just a few small issues, you should know that they will only become worse during winter as ice and snow accumulate, melt, and then refreeze. Spring can be the best time to replace your roof if you are not experiencing any problems with your roof. It is typically not a busy time in the roofing industry compared to fall and summer, which means that materials will probably be cheaper. The major problem with spring is that people catch up on their finances, receive their tax refunds, and they no longer have to worry about the snow and cold weather. It is when the construction rush starts. Whenever possible, you should delay installing the roof until May. The start of summer is a great time for roof replacement. However, the middle of summer when the temperatures are soaring might not the ideal time. Roofing contractors often install roofs throughout summer, but the high humidity and heat makes it unpleasant for the roofers and can affect the materials. The high temperatures may soften the asphalt in the shingles thus making them less durable during installation, which means that they can get scuffed up if walked on. Summer is also an excellent time for roof replacement installation because many people love going on summer vacations. Summer also has several key holidays such as Labor Day, Independence Day, and Memorial Day, and many homeowners usually prefer not to undertake any major construction projects at this time. Ideally, you should schedule your roof replacement installation between the 4th of July and Labor Day. The ideal weather for roof installation is in the fall when temperatures range between 45 and 85 degrees Fahrenheit. The lower temperatures during the fall allow Roofing contractors to work for longer hours without necessarily being overheated while the favorable weather makes it is easier to repair, replace, or install roofing systems. Shingles will have sufficient time to seal effectively and will be ready to take on the elements when the harsh weather season kicks in. Fall might be the best season for roof replacement installation since the weather is so great, but it is also the worst time to get it done. It is the time when most people realize that winter is just about to kick in, which is why it is one of the busiest times of the year for roof repairs and replacement. It is thus important to plan ahead and contact the roofing contractor before their fall schedule is filled. The busiest times of the year when it comes to roof installations, repairs, and replacements are late summer and early fall. Contractors often raise their prices during these times. Homeowners come to the realization that winter is right around the corner and would like their roof replaced before it is too late. If you want to enjoy cheaper rates, you should schedule the roof replacement before this time. Investing in a new roof is not something that most homeowners look forward to because the cost of roof replacement is expensive. Instead, they prefer putting off as long as possible and wait until the situation becomes quite dire, which forces them to make a quick decision and eventually schedule their long-overdue roof replacement. However, this is not recommended. If you wait until the roof starts leaking or succumbs to another major issue, it is highly likely that such issues will damage other aspects of the property and you might find yourself paying for much more than just the roof. Planning ahead and doing the Roofing replacement installation on time gives you sufficient time to make a well-educated decision. Roof replacement installation is not something to take lightly. It is a significant investment capable of impacting the look of the exterior of your home as well as the level of comfort and efficiency inside. When is the right time to have a replacement roof installed? When it needs to be replaced and not after. The information provided here should help you choose which time of year is ideal for roof replacement installation in your area.